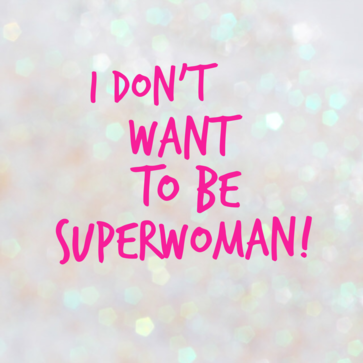 As a working mum of two little girls, I know the pressure we all put on ourselves to be Superwoman. We feel guilty if we aren’t busy all the time. We feel awful if our jeans don’t fit anymore. We feel like a bad mum if our little one has a meltdown in the supermarket. We feel inadequate if our social life isn’t Instagram worthy. But why? Who is judging us? Other women? Probably not, because they are also worrying about who is judging them. And what happens if we do reach that Superwoman state? I know one thing for sure – there won’t be anyone handing out medals, patting us on the back and telling us “Well Done. You are AWESOME!”. So this year I’ve decided I don’t want to be Superwoman. I don’t want the pressure or the guilt. I want to enjoy time with my family at home and in the garden. I want to find time to see friends that I haven’t seen in years. I want time to focus on my health and fitness. If the house is a mess in the evening – who cares? I would rather spend the time reading with my girls or going for a run than tidying up. Therefore, my new year’s resolution for 2017 is not being Superwoman! Phew - I feel better already! !